Revolution Books: "We Will Not Be Complicit...We DO NOT Consent! No Government Spying on Whole Populations. Hands Off Snowden & Manning. Close Guantanamo NOW." "We Will Not Be Complicit...We DO NOT Consent! 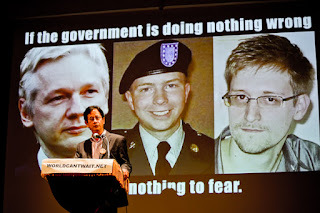 No Government Spying on Whole Populations. Hands Off Snowden & Manning. Close Guantanamo NOW." June 27th, Thurs. 7 p.m. Through an act of tremendous courage and self-sacrifice, Edward Snowden has revealed the most massive government spying in history into the communications and activities of billions of people on the planet. If you are outraged by these revelations, by the trampling on fundamental rights, and by the war crimes being carried out in our name view and discuss this evening of conscience, with speakers and performers, held 6/19/13 in New York City.